Aire Sheet Metal is a Mechanical and Architectural Sheet Metal contractor, located in Redwood City, primarily involved in the design and construction of commercial projects of all sizes. ASM was incorporated in 1971, and is maintained as a family owned corporation. ASM is signatory to Local 104, Union Sheet Metal Workers, and operates with a group of approximately seventy Local 104 members, including an onsite sheet metal fabrication shop. Aire Sheet Metal’s construction volume is approximately $20M annually, with 80% of the work coming from mechanical systems installation. Aire Sheet Metal is a family owned business serving the Bay Area since 1971. Our Mission is to provide a quality of service that positively affects the community we live in. Our commitment is to provide a service to our clients that will make us the logical contractor of choice when looking for construction solutions. We are a diverse company equally adept at providing a range of services in HVAC (design, plan and spec, fabrication and installation) and Architectural Sheet Metal (metal panels, siding/decking, metal roofs, and flashing). 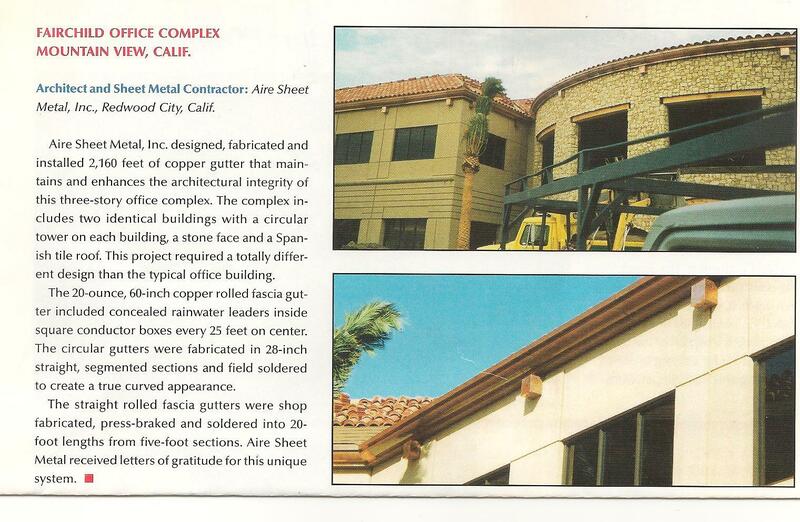 Aire Sheet Metal performs both design / build and plan & specification HVAC projects throughout the bay area. We have a licensed PE on staff with experience in office tenant improvements, data centers, biotech R&D, and manufacturing facilities, clean rooms, and retail environments. We are a LEED Certified Contractor committed to the environment we share with our community. Our Project Management Team has an average experience of 18 years as construction professionals serving the Bay Area. Our expertise includes schools, convention centers, hospitals (MOB) (Tenant Improvement), hotels, Theaters and Public Works. Our lead supervisors of field and facility operations average 24 years of experience. Aire Sheet Metal is committed to providing and maintaining a safe work environment for all employees and other personnel working among us. Our commitment to safety is demonstrated by our current safety mod rate of 0.75, which is significantly below industry averages. We use the latest technology and software for bidding on projects. We also partner with special organizations to find the right projects that fit squarely with Aire Sheet Metal. At ASM, we use highly sophisticated computerized architectural equipment to spec out projects to ensure the highest caliber of services to the entire project. Using the latest machines and computer systems, our mechanics will design fabrication with the most exact precision available.